Ranking right up there with blooming flowers and finally being able to open your windows again, the Party Poker Spring Million is one of the best signs that spring is here. As usual, the Spring Million will offer a $1 million guaranteed prize pool, and this year’s event takes place on May 6th at 13:30 ET. If you’re interested in playing for a piece of this massive prize pool, you should sign up at Party Poker through RakeTheRake; this will get you a 100% match deposit bonus up to $500 and a top rakeback deal. Once you’ve completed the simple sign-up process, you can either pay the $600 + $40 direct buy-in to enter the 2012 Party Poker Spring Million, or you can play in the various satellites that are currently running at the site. $2 Spring Million Sub Qualifier Speed Rebuy – Runs daily, top finishers win a Spring Million Qualifier ticket. $8 Spring Million Sub Qualifier Speed – Runs daily, top players earn a Spring Million Qualifier ticket. 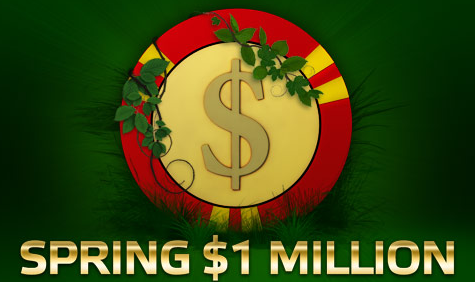 $70 Spring Million Qualifier – Happens daily, 1 in 10 players win a $640 Spring Million seat. $1 Spring Million Sub Qualifier Speed Rebuy – Runs daily, top finishers move on to the Spring Million Rebuy Qualifier. $27 Spring Million Rebuy Qualifier – Happens daily, one Spring Million seat is awarded for every $640 in the prize pool. $2 Spring Million MEGA Friday Sub Qualifier Speed Rebuy – Takes place daily, top players win a Spring Million MEGA Friday Satellite ticket. $6 Spring Million MEGA Friday Sub Qualifier Speed – Runs daily, highest finishers earn a Spring Million MEGA Friday Satellite seat. $55 Spring Million MEGA Friday Satellite – Happens every Friday at 17:00 ET, five $640 Spring Million tickets guaranteed. $47 Spring Million Sub Qualifier Extra Speed – Runs daily, top finishers move on to the Spring Million Qualifier Extra. $172 Spring Million Qualifier Extra – Happens daily, one out of every four players wins a $640 Spring Million ticket. Daily Country Specific Freerolls – Top 10 players from each freeroll qualify for the Spring Million Special. Daily Player Points Qualifiers – Two of these daily qualifiers available to players who earn 10 points and 25 points in a day; qualifiers play in Spring Million Special. Spring Million Special – Friday at 15:35 ET, five seats for the $640 Spring Million will be given away. Qualifiers are running now, and you can find all the information for the Spring Millions over at Party Poker, but make sure you sign up through RakeTheRake for the best rakeback deal. You actually make it seem so easy along with your presentation however I to find this topic to be really one thing which I feel I’d never understand. It seems too complex and very wide for me. I am having a look forward in your next submit, I will attempt to get the hang of it!